Hawaii lawmakers have set up infrastructure so desperately needed for the coming wave of senior citizens. Being the primary caregiver for my 84-year-old mother while also working is a complicated juggling act. I am lucky that the state’s Kupuna Caregivers program is there to help provide an “extra hand” of support by providing assistance for families like mine. 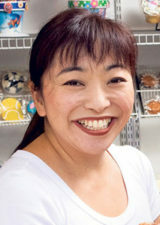 My mom, Irene Yafuso, was the co-founder and owner of Larry’s Bakery in Honolulu. She started running our family business after my father Larry died in 1978. About four years ago at age 80, my mom was diagnosed with Alzheimer’s disease. One of the hardest things about that time was that she didn’t realize she had the disease. She once told my older brother how upset and sad she was that people thought she was sick. “I don’t have Alzheimer’s,” she said to him, teary-eyed. 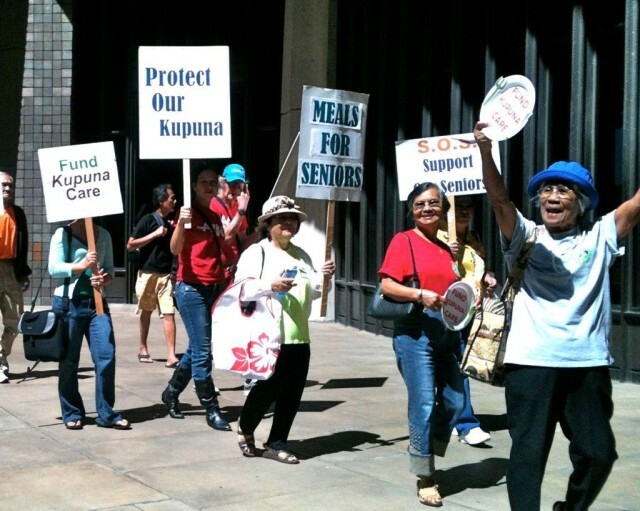 A rally for seniors at the Hawaii State Capitol in 2011. This year’s rally is Monday at the Capitol. While she tried very hard to maintain her independence, waking up at 2 a.m. every day to go to work at the bakery, our family could tell her memory, and her safety, were being affected by this terrible disease. My brothers and I had to figure out how to address our mother’s health while still carrying on our parents’ legacy. We tried our best to continue to run the family business, but finally in 2017, we made the tough decision to close Larry’s Bakery and focus on my mom’s care. From that point forward, I became her full-time caregiver. At first, I thought nothing of it. My mom did so much for our family and me over the years that caring for her now would be the least I could do. However, over time I found myself cancelling my own activities in order to accommodate my mom’s appointments. I stopped doing things I wanted to do so that I could be there to take care of my mom and put her needs first. Finances also became a challenge. My mom’s monthly Social Security check gets used up very quickly to pay for things like medical insurance, medication that isn’t covered, and other expenses of her daily living. I often use my own savings to take care of some of these things once her money runs out. Eventually, when all of our resources started running low, I knew I had to return to work. But who would care for my mom then? Through meeting so many other seniors and their caregivers, I was surprised to learn how many people are in the same situation as my family. Sometimes, I felt that I was the only person in the world facing these difficult issues. As our population ages, these problems are becoming the norm. That is why I was so pleased to hear about the Kupuna Caregivers program and how it could help our family. Once we were approved, the program provided $70 a day in services, which helps us send my mom to daycare while I go to work. I would not be able to stay employed if I didn’t receive this help. It’s fortunate for Hawaii residents that the Kupuna Caregivers program is available to give local families that extra cushion to help balance both caring for their aging parents and staying in the workforce. Lawmakers had the ability to see that the next big issue in Hawaii will be our aging population. By setting up the Kupuna Caregivers Program, the first in the nation geared towards helping working caregivers keep up with their jobs and their caregiving duties, the state is helping set up the infrastructure that is so desperately needed for the coming wave of kupuna. With the little help we get to send my mom to daycare, we are able to keep her living with me at home, and I know that’s what she would want. I think local families prefer keeping their aging parents or grandparents at home versus placing them in an assisted-living facility, an option which many of us cannot even afford. I owe it to my mom, after she has given so much to all of us, to allow her to age where is the most comfortable. Lawmakers should continue this program to help Hawaii’s local working families and to help us, the working caregivers, stay employed. On Monday, Caring Across Generations, the Hawaii Family Caregiver Coalition, AARP, kupuna, their caregivers and other kupuna advocates will come together at the Hawaii State Capitol during the annual Caregiver Awareness Day. They will make their voices heard in support of the Kupuna Caregivers Program and its accompanying bills before the legislature, House Bill 467 and Senate Bill 1025, that provide funding for the groundbreaking program. Iris Yafuso-Toguchi is the primary caregiver for her mother and currently works full time. The Yafuso family owned and operated Larry's Bakery for 57 years until its closing in 2017.